The DT-501X Panel Meter Tachometer with optional outputs is a multi-faceted instrument ideally designed for speed, rate or time monitoring applications when combined with a compatible process speed sensor. 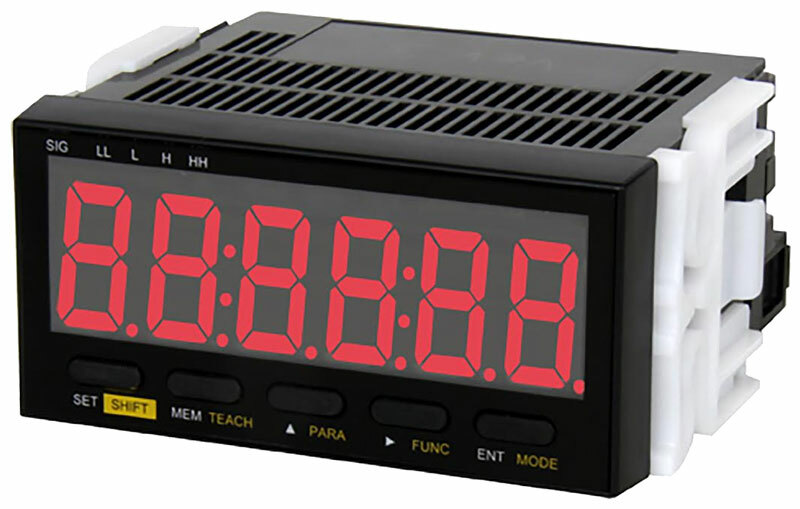 With its industry-leading 0.87” (22 mm) height display and compact body depth of only 3.6" (92 mm), the DT-501X allows mounting in tight panels or small enclosures. Added versatility is offered with its range of standard inputs which include NPN, contact and square or sine wave signals produced from devices such as pulse generators, proximity sensors, photoelectric sensors, magnetic sensors, rotary encoders and NPN OC transistors. The DT-501X is fully scalable and possesses four selectable modes allowing it to measure various process speeds, rates and times: tachometer, flowmeter, process time span and elapsed time mode which displays the inverse to the input signal, common in oven conveyor applications. 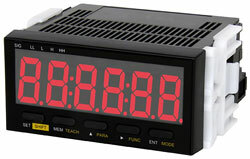 An added teaching function auto-scales the control which simplifies the set-up by properly coordinating the display with the input of the sensor’s signal. Analog, contact, or SSR outputs are available for additional automation control.